Roosevelt’s Strong Women Strong Girls service project has been fine-tuned! I think I can speak for my fellow mentors in saying we are extremely proud of the design. The background of the project includes an educational portion: for the past few weeks, the girls have been reading announcements on the loudspeaker about the perks and utter importance of recycling (which their school does not do). They have assumed their roles as educators, an exciting position, and have been doing a great job. Then, as far as the actual service projects goes, the overall plan is a three-part model in which the girls will transform a dead, weedy garden into a friendly, bright atmosphere to relax in during recess. Although the girls are graduating to middle school this summer, our hope is that this garden will flourish and return every spring (especially considering our choice of annuals). However, besides the actual experience of building a garden, there are many lessons we hope to transfer. For one, many of these girls doubt their abilities and power, either because of their social status, race, or gender. Transforming an entire garden using only Girl Power should definitely prove this untrue. This is an empowering opportunity. Also, the importance of planting a garden is not solely for aesthetics, but also to improve environment conditions; in general terms, make the world a better place. The girls spoke about an interest in having butterflies inhabit the garden. Although this would certainly be beautiful, such a task is difficult to achieve. We did consider the type of plants butterflies are attracted to, but creating a butterfly garden on a budget is near impossible. However, we decided to bring another form of life into the garden – birds! 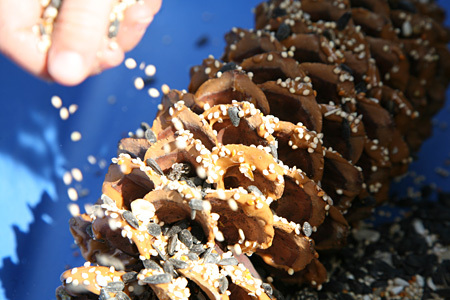 Pinecone bird feeders are a great way to remain environmentally friendly while helping out our flying friends. If you have never made them before, the only supplies you need are peanut butter, pinecones, and birdseed. The process is simple but fun, especially if you start to see results! After spreading a pretty thick layer of peanut butter on the pinecones, roll them in birdseed and hang them in a garden or other outdoor area. The only complication: carrying a 20lb bag of birdseed around campus for three hours. When we went to inspect it, Roosevelt’s dilapidated garden area had three random stepping-stones miscellaneously placed… we knew we had to do something about this. Therefore, when we came across this possibility, we were very excited; it is an all around great project to do with the girls and it is CHEAP! The idea is to mix your own cement and make stepping-stones out of it. “Quickcrete” is the best option out there: it is about three dollars for a 60lb bag (which I refuse to carry!!). After mixing the powder with water, you basically pretend you are making a cake – we plan to use 15 aluminum pie plans, differing in shape. While the cement is still wet, you can put other pebbles into it or make handprints etc. We bought a bag of goldfish pebbles, pink of course, to spell out SWSG. This aspect of the project allows the girls to leave their “legacy” behind. The stepping-stones will be there for years, and they will have made them. This will probably be the most difficult part of the process: not only will the girls hate doing it, but we will too! However, hopefully the explanation of the importance will be enough to convince the girls to just get through it. To recover for the morbid and boring reaping from the week before, we will be planting! The mentors met for about two hours to discuss the types of plants we should plant. We had a lot to consider: skill level, difficulty, life span, and growth period (since the girls will not be there for July and August). We were lucky to find a secret gardener was among us – her guidance was fundamental in our choices. We decided on several easy seeds, like wildflowers, which are both pretty and low maintenance. We also wanted to be sure the girls would see results, so we purchased several bulbs as well as bushes. Hopefully the weather permits, and everything grows and flourishes into a garden as strong as it’s parents. 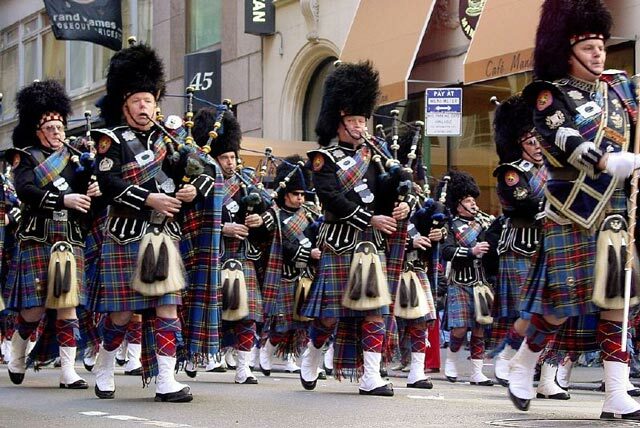 I have to say, I honestly did not realize how exciting St. Patrick’s Day would be in Pittsburgh. However, by the time I woke up on Saturday morning, there were tons of green students outside. I looked out my window to see green everything. Now when I say green, I mean clothes, hair, body paint: the works. Later, as I went to Towers brunch at about 11:30, students were just returning from the parade. They were chanting, making noise, and having fun. Everyone was wearing green still, except me of course. It seems like the parade was a great gathering for Duquesne and Pittsburgh. I did not quite make it to the parade, so if you did, let me know how it was! 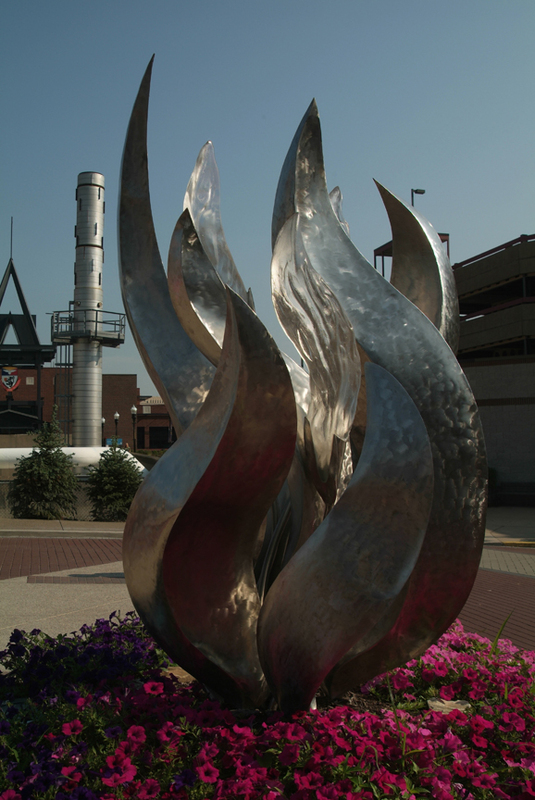 the Spirit of Duquesne ...so THAT's what that thing is!! After much deliberation, I am ready to publically announce that I am going to be a Resident Assistant next year. I had been afraid of “jinxing” myself etc. which I know was silly, but still not worth the risk. Let me quickly fill you in on the background events. The application process began in early January, December even, for some. For me, it was a last minute decision. I quickly filled out the application and asked around for recommendations. I turned it in the day it was due (which is very unlike me – I am usually way ahead of the game) and hoped for the best. I had to schedule a half hour interview, which I nearly puked before I was so nervous, and attended a “Group Process”. As the Group Process begun, the Resident Directors asked up to write our names on a dry erase board and pose with it for a photo. (This is probably as close as I will ever get to American Idol auditions.) At that time, I really began to doubt my chances. As I glanced around the room and tried to count how many others had applied for the same exact position as me, I was pretty sure that I would not be chosen to fill one of 82 positions. I sat there and tried to convince myself that living in Towers with other sophomores would be more fun anyway. At the end of the Group Process, the director of Res Life explained we could pick up our official letters in five days. There were three possible responses: Yes, No, and maybe. That Friday, I opened my letter with my best friend. I was ecstatic to see that my letter began with the word “Congratulations”. Since that telling day at Group Process, I have found that there are many benefits of being a Resident Assistant, more than I had realized at first. Next year, I will have my own room with my own bathroom, which is great, but there is so much more this position will offer me, and I don’t mean on a resume. This position will truly help me grow and develop unique skills. I am also meeting a new peer group, a community of students, which is diverse but wonderful. I have begun training for next year and not only am I learning valuable information about community and diversity, but about Duquesne University as well. For example, I recall someone saying Duquesne is the only Spiritan university in the world! Strong Women Strong Girls is Going Green! I think a Strong Women Strong Girls update is necessary. Second semester SWSG is structured slightly different from our first semester curriculum. For all chapters of SWSG (Boston and Pittsburgh alike) second semester curriculum is based around a service project. Each chapter picks what type of project they are doing. (I’ve used the term ‘chapter’ a few times. By this, I mean university. For example, we are the Duquesne chapter.) Duquesne chose “Going Green” among three other options. After that, the decision is left to the individual schools. Roosevelt, the school I mentor at deliberated together. While the girls suggested all the ideas, we eventually pushed them towards one particular one: renovating a morbid garden that the school had, let’s say, “let go”. We were thrilled by this suggestion, because not only is it more thrilling than picking up trash, it is a great way to help the environment and contribute to the community. It’s actually a really great piece of land, and it has awesome potential! After checking with the school principal, we were even more excited to hear that we will not have to pay out pocket for the supplies. We have been planning – we want the garden to be colorful – and the girls are very excited to begin. Reducing means cutting down the amount of garbage that is made. The best way to reduce is to only buy items that you really need. Reuse means to use something again instead of throwing it away. Usually, this means finding a new use for it. For example, you could turn a jelly jar into a drinking glass. 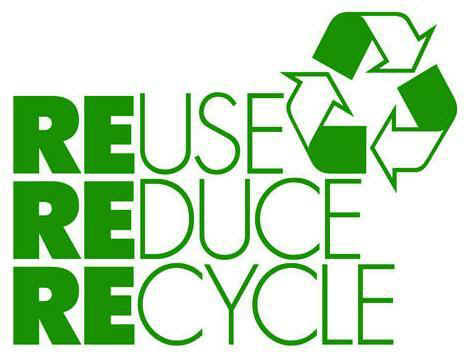 Recycling means taking materials from items you have already used and turning them into brand new products. Most aluminum cans are made of recycled products, because aluminum would take 350 years to disintegrate! Paper accounts for 40% of solid waste in the United States, which is about 72 million tons annually. If every household replaced one roll of regular toilet paper with one recycled post-consumer waste roll, four thousand twenty-four trees would be saved. The U.S. uses nearly $1 million worth of energy every minute. Instead, with one million dollars, you could also buy 25 Mercedes Benz cars or 4,000 IPod Touches! That is why it is important to turn out your lights when your leave a room. Automobiles, motorcycles, trucks, and buses in the U.S. drove over 2.8 trillion miles in 2002 — comparable to driving to the sun and back thirteen thousand, four hundred and forty times. One way to cut down on this is to carpool. That means getting a ride to school or work with someone else. If everyone else at Roosevelt did that, the amount of miles driven would lessen greatly by the end of the year! Consider Going Green this spring! I had previously stated I planned to spend part of my Spring Break in Boston. After just making it home to New Jersey from the Northeast, I had a few comments I would like to share. First, I actually was not staying in Boston. My best friend, Claire, goes to Tufts University in Medford, MA, which is about 20 minutes out of the city. This school was absolutely beautiful, although it was much more isolated than Duquesne University. There were some very unique aspects about the school. 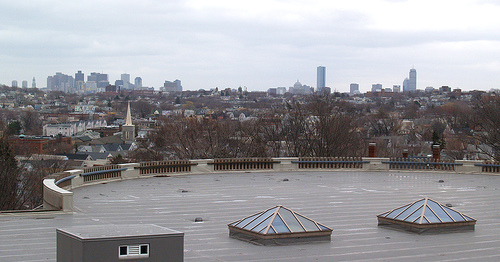 On my campus tour, I discovered that the library roof is student accessible and has a garden and a wonderful view of the city (not as nice as ours of the Southside of course). It was a really beautiful place, both in the day and at night. I also found it very cool that the chemistry building was specifically built to implode instead of explode because of the chemicals it houses. In Boston, everyone uses the “T”, which I believe might stand for the train. It is very similar to the subway. My friend Claire was astonished that in Pittsburgh, students use the bus system much more often than the subway equivalent. We argued intensively about the pros and cons of our respective public transportation source. In sum, while the bus system allows for transfers, and ends up cheaper overall, it does not stop at every stop, much like the T, so it is easier to get lost. In my opinion at least, of course the bus system won out. I also uncovered a little known secret through my travels. Boston is a very hard city to travel to because the airport only flies into three airports: Cleveland, Newark, and some other location. So, in order for me to get there last Thursday, I had to fly on a connection plane, which had all of ten aisles to Cleveland. After this landed, I was delayed about two stressful hours until I finally left the ground, Boston-bound. On the way home, instead of traveling back to Pittsburgh, I was coming home to New Jersey, which offered many more options. After doing a lot of research, I discovered the Bolt Bus, which is an incredible way to travel! The Bolt Bus is equip with leather seats, outlets and Wi-Fi. Unfortunately, the Bolt Bus only goes to major cities, so yesterday I took the Bolt Bus into New York City from Boston. It was a great way to visit cities on weekends, especially because tickets range from 10 to 20 dollars! For me, the Bolt Bus is a great asset to me, living so close to New York City. I can take cheap weekend trips to Philly, Washington D.C. or Boston again. Although I don’t love traveling alone, I guess I will have to get over it if I want to be a world traveler one day. Happy Spring Break! If you are traveling somewhere warm or visiting friends, enjoy your trip. If you went home for spring break, enjoy home cooking. I got the best of both worlds! Murmurs of the “American Dream” have resounded plentifully through out the country since James Truslow Adams coined the phrase in his 1931 book, Epic of America. Even I, a mere eighteen year old girl, have both spoken and heard this term several times. Despite this fact, only recently have I begun to grasp the complexity and beauty of these words. I’ve grown up privileged, spoiled even, in a comfortable suburb of New York City, full of Coach Purses, Ipod touches, and the best Canolis imaginable. However, my sheltered upbringing does not come close to counterbalancing my interest and reverence for other cultures. I use the word ‘culture’ rather loosely; I endlessly thirst for knowledge about religions other than Catholicism, third world countries, and even the more shadowed areas of our own country, where this “American Dream” still reins. In an attempt to learn about southern culture, and learn about myself, while lending a hand and sharing hope, I embarked on my second Mission Trip to Bay St. Louis, Mississippi, where Hurricane Katrina’s wrath may have been most brutal. We were a large, quirky group that consisted of 17 of my peers, 10 adult leaders and Notre Dame’s newly retired priest, Father Ed (or “Fred” for short). As this was my second trip, I prepared myself for the destruction and poverty southern Mississippi held. Many streets were still desolate, aside from the concrete foundations that made it through the storm. Stores were scarce, as the economy was too atrocious to fight, and there was even a “homeless resident trying to adopt the camp”, as the camp director put it. I felt sorry for these people; they had so much less than I do, both materialistically and figuratively. My future is looking bright; I am enrolled in the university I hand picked, while I utilize my parents support and encouragement. Yet several Mississippians I met were living on their own, working every day, or raising families by the time they were my age. I looked around me, at the barren streets, at the hopeless people, and I felt genuine sorrow and sympathy. While on lumber run to Home Depot with my construction supervisor, Ammy, I tried to get to know and understand her. Bearing a name that means beloved, Ammy was Native American and left her reservation to come to this…well, wasteland. I was truly impressed; did she really give up her home, her family, and her culture to help these people thousands of miles away? I asked her, “Why Mississippi” and she replied, straight faced, “to live the American Dream”. I tried hard to hide my astonishment, yet it was as if she was reading my mind; she asked if I thought I was spoiled. This launched us into an extremely heartfelt conversation, as I tried to explain yes, I was spoiled, but no, I do not get everything I want. As I shared several examples from my childhood paralleling my general upbringing, she was shocked to find that I have been spoiled but in a much less superficial aspect than she ever considered. The limits my parents have set with me have privileged me in a much deeper way; I can always realize and respect the right thing to do, which will open endless doors in the future. “How”, I asked her “is this life the American Dream?” As if she already had an answer prepared, she affirmed “if you work hard, you will achieve”. All of my preconceived notions of this “American Dream” shattered instantly. How could I have been so close minded? The American Dream in the Tri-State area seems to be moving fast, getting rich, and retiring early, and I was almost fooled by my fellow New Jerseyans. But that lifestyle, it could not be what Adams meant when he praised America and the opportunities it offered. I was deep in thought for the rest of the day, tuning in and out of conversations, while mentally revisiting my talk with Ammy earlier. Before bed, we headed to Wal-Mart for some after dinner entertainment, the center of this lonely town. As I sat in the back of our SUV, I listened to Fred’s sincere voice in the front seat. He turned around to me, smiled, and said, “After a nice, hearty dinner, we’re heading off to Wal-Mart with our family – The American Dream”. There it was: that phrase again. My mind kicked into four wheel drive; what aspect of the night was he targeting? The simplicity? The comfort? The… prospect of happiness? This weekend, it seems that I have come down with quite a cold. Although I don’t believe I have a fever, and I’m not exactly bedridden, this is my first experience being sick away from home. (I’ve been taking my Airborne and Echinacea.) It was difficult taking care of myself, especially since I am so used to Mommy and Daddy giving my medicine and essentially, fluffing my pillows. Don’t try to do anything. It stinks, I know, but just lie in bed and take care of yourself. I happened to get sick on a Friday morning, and I’m still feeling pretty lousy today, so it really takes self-restraint to just be getting into bed when everyone else is getting ready to go out, but it is worth it. You will feel better much sooner. Don’t forget all the things your parents told you when you were home, like take your medicine and stay in bed. Tons of people stop taking their medicine, especially antibiotics, long before they’re finished with them because they feel better. If you want to get healthy, and stay healthy, take your medicine! Know when to take your temperature. Although I came to school with an intensive first aid kit, one thing not included was a thermometer. As I knocked on doors up and down my hall, I found that no one had one either. If you think you may have a fever, it’s important not to let it get too high. Either take your temperature or take some Advil to lower it. Sleep as much as possible, but when you’re not sleeping, keep your mind busy. Being sick makes you grumpy, and being away form home can feel lonely when you’re sick. While sleeping is great for your illness, if you find you cannot fall asleep, try not to just wallow in your lonesomeness. Maybe put on the TV or read a book. That said, I wish everyone great health into spring break!